Posted April 16, 2018 by Fiona Greenfield & filed under Funding. 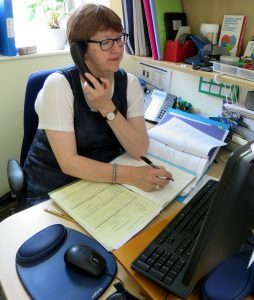 Bucks’ Freemasons recently donated £1000 through the Heart of Bucks Foundation to Relate Mid Thames and Buckinghamshire to purchase a new computer and some phone compatible headsets for use by the counsellors and appointments team. We have a head office in Maidenhead, and offices throughout Buckinghamshire and East Berkshire and although Relate MTB is a member of the national Relate Federation we are an entirely independent charity, relying on fundraising to provide professional counselling to local people regardless of their ability to pay, through its Bursary Funding Scheme. Relate MTB counsels more than 1,000 people of all ages in the local area each year, on matters such as depression, cancer (in association with Macmillan nurses), mental health issues and all types of relationship problems, (including loneliness). The picture shows Fiona Greenfield, Centre Director of Relate Mid Thames & Buckinghamshire, juggling the phone whilst trying to take notes.